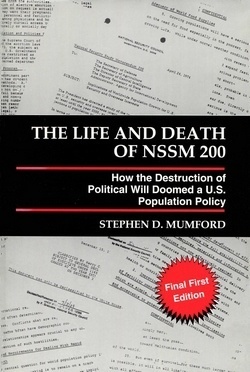 Excerpt from chapter 14 of our chairman Dr. Stephen D. Mumford’s seminal book, The Life and Death of NSSM 200: How the Destruction of Political Will Doomed a U.S. Population Policy (1996). The book is available at Kindle here, and is available to read for free here. Over the past 25 years, American political will to deal with the overpopulation problem has been destroyed. NSSM 200 lived and died. As President Nixon’s Special Message to Congress correctly predicted, these outcomes are certain to have an enormous impact on the lives of everyone on the planet. The story of the creation and demise of NSSM 200, and of how the government was thwarted in its effort to resolve the overpopulation problem, received no mention in the news media or any other information source. Few Americans are aware of what is perhaps the most important story of the 20th Century. How could it have been suppressed and for what reason? Seldes’s extensive study of the Spanish Civil War and the related control of the American press by the Catholic hierarchy is exceedingly instructive for all who are concerned about population growth control. Population growth control is by no means the first instance of absolutely pivotal Catholic hierarchy intervention in American press coverage of an important issue. The hierarchy has a history of manipulating the press to insure that Papal interests are served even at the expense of American interests. After decades of intense study, in an August 1978 article, Seldes concludes: “The New York Times is still in fear of reprisals from the Roman Church in America, as it was during the entire Spanish War when under managing editor Edward L. James and the notorious ‘Fascist phalanx in the bull-pen.’ James’s four, incidentally Roman Catholic, editor assistants, bowed to the ‘power house on Madison Avenue,’ Cardinal Spellman’s residence, and a certain Father Thorning, and published scores of falsifications from Spain.”[260ii] Seldes provides strong evidence to support this conclusion. For example, he cites The New Republic magazine: “The New Republic, to its credit, in ‘Who Lied About Spain?’ when the war was over 1939 listed the [New York] Times man with Franco as the number one falsifier.” In a November 1981 article, Seldes concluded that all of America’s 1,750 daily papers were similarly terrified by “the Catholic Church propaganda campaign.”[260jj] This “terror” that Seldes describes is still pervasive and has led to the disappearance of a free press in America in matters of concern to the Vatican, such as the recognition of overpopulation as a national security threat. But let us begin the story at the beginning and allow Mr. Seldes to lay out the evidence for us item by item. In 1931, Spain became the Republic of Spain, a liberal democracy that separated church and state, ended State monetary support for the church and adopted the principles of Freedom of Conscience, Freedom of Religion, and Freedom of the Press. The Vatican feared for the Church’s very survival in Spain. There had been four insurrections since 1835, and it was the Spanish people, the poor workers and poor peasants, who burned the churches because they blamed the hierarchy for having persistently backed the upper class. [260ii] The latest uprising against the Catholic Church took place throughout the country in July, 1936. [260kk] One historian described it as “the work of masses of common people, a spontaneous uprising.”[260kk] The Vatican feared that the liberal democracy with its freedoms would spell the end of the Church in Spain. ‘Guernica’ was painted by the Cubist Spanish painter, Pablo Picasso in 1937. The title ‘Guernica’ refers to the city that was bombed by Nazi planes during the Spanish Civil War. The painting depicts the horrors of war and as a result, has come to be an anti-war symbol and a reminder of the tragedies of war. The Spanish War of 1936-39 is often called a civil war. But this was a lie from the beginning. It was not a civil war but an invasion by Hitler, Mussolini and Salazar fascists or what Seldes refers to as the Fascist Internationale in league with the Vatican. Mussolini landed 200,000 infantrymen from his Black Arrow division in Franco-held seaports and Hitler sent Goering’s Condor Legion to bomb civilians,[260ll] involving an estimated 50,000 German aviators. [260jj] All this had been envisioned in Rome in 1934. Seldes writes, “Mussolini and two representatives of the plan … met there and even promised help in overthrowing the Republic and establishing a fascist type of government. They also met with Hitler that same year—and the confessions of the Nazis at the Nuremberg Trials confirm the plot.”[260kk] There was to be an uprising of treasonous Republic officers led by Franco, the invasion by the Italian and German forces and the promulgation of the lie that this was an uprising against a communist take-over of the Republic and a “Christian crusade against atheistic communism.”[260mm] The creation of this great lie would be primarily the responsibility of the Vatican. Cardinal Pacelli, then papal secretary, began this campaign of falsification in America when he came to Hyde Park [New York] to enlist the aid of President Franklin Roosevelt in this undertaking. Pacelli, who three years later was to become Pope Pius XII, was successful. Roman Catholic layman James Farley, a boss of the Democratic party, Cardinal Spellman, and Joseph P. Kennedy, FDR’s ambassador to London, promoted Pacelli’s position. Each warned Roosevelt he would lose the Catholic vote unless he embargoed arms to Spain and joined Chamberlain’s so-called Neutrality Pact. The making of the “Christian crusade against communism” myth began immediately following Pacelli’s visit to America. “The New York Times, October 1, 1936, was informed from Rome that Pacelli had ‘left for the United States of America to enlist the support of President Roosevelt and the U.S. Government for the anti-communist campaign the Pope has been waging for some time. The Holy See regards the spread of communist doctrine as the gravest and most threatening danger hanging over the world.’ When the cardinal arrived in New York The New York Times headline read: ‘Pacelli Reported Seeking Aid in U.S. in Anti-Red Drive'”[260mm] A myth was born. The myth of a Christian crusade against Communism in Spain persisted for decades, despite honest revisionist historians. It was not until 1971 that the myth was finally destroyed by none other than the Roman Catholic hierarchy of Spain. This important correction of history was slurred in the world press and is probably not known to more than one person in a million today (emphasis added). “In 1971—and again in 1972, 1983 and succeeding years—a majority of Spain’s 94 bishops and 151 priests attending voted 60% or more for the Church’s apology but never officially passed it.”[260ii] By taking this action, Cardinal Taracon probably prevented widespread killing of priests and nuns upon Franco’s death in 1975. On the other hand, “The spokesman for the American Catholic Hierarchy, who so powerfully influenced American foreign policy—Farley, Kennedy, Cardinals Hayes, Spellman and Dougherty” and the archbishops and priests and Catholic laymen who so intensely lobbied in Congress, did not join their Spanish brothers and never admitted error. [260mm] Their vital roles and that of the Vatican are unquestionable in the crushing of this liberal democracy. Franco got support from four main sources: the Catholic Church, Spanish conservatives, the German, Italian and Portuguese fascist governments, and big business in the US and elsewhere. These Spaniards were murdered for only one reason—they believed in liberal democracy, just as we Americans do here in this country. Seldes documents the leading role of the Vatican in the destruction of the Spanish Republic. The murder of 100,000 liberal democrat prisoners by Franco was undoubtedly made easier by Pope Pius XI. Referring to the uprising against the Roman Church throughout Spain in July, 1936, Pius XI attacked the “ruinization, destruction, villainies, barbarities by the savage forces whom it is impossible to dignify with the words human beings.”[260kk] Dehumanization always makes mass murder seem less reprehensible. Q. Is every Liberal government hostile to the Church? A. Evidently, since whoever is not with Christ is against Him. Q. Then there is no grade of Liberalism that can be good? A. None: because Liberalism is mortal sin and anti-Christian. Q. What of Communism, Socialism, Modern Democracy, An­archism, and the like sects? A. They are contrary to Catholic faith, to justice, and to virtue, and as such condemned by the Church. A. The Liberal system is the weapon with which the accursed Jewish race makes war on our Lord Jesus Christ, and his Church, and on the Christian people. Q. What does freedom of the press mean? A. The right to print and publish without previous censorship all kinds of opinions, however absurd and corrupting they may be. Q. Must the government suppress this freedom by means of censorship? A. Because it must prevent the deception, calumny and corrup­tion of its subjects, which harm the general good. Q. Does one sin gravely who subscribes to a liberal newspaper? A. Yes … Because he contributes his money to evil, places his faith in jeopardy, and gives a bad example. Q. What rules can be given to know liberal papers? 1. If they call themselves liberal. 2. If they defend freedom of conscience, freedom of worship, freedom of the press, or any of the other liberal errors. 3. If they attack the Roman Pontiff, the clergy, or the religious orders. 4. If they belong to liberal parties. 5. If they comment on news or judge personalities with a liberal criterion. 6. If they unreservedly praise the good moral and intellectual qualities of liberal personalities and parties. 7. If, in reporting events concerned with the battle waged by Our Lord Jesus Christ and His Holy Church against their enemies today, they remain neutral. Q. What is the rule to avoid error in these cases? These two catechisms make it clear just how strongly the Catholic Church feels about freedom of the press, as well as with what disdain and contempt it views this vital democratic principle. The death of NSSM 200 and the disintegration of American political determination to overcome the overpopulation problem occurred with the knowledge of only a handful of Americans over the past two decades. Has the rabidly anti-free press posture of the Catholic Church resulted in suppression of the American press in reporting on these vital topics? 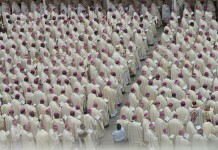 Could the Church, with its bishops and laymen, have had such an effect on the American press? Let us examine Seldes’s findings regarding the Spanish War of 1936-39. Of course, Seldes was by no means alone in his assessment of the Catholic leadership’s corruption of the press (particularly The New York Times). The Churchman published numerous articles on this topic,[260ll] as did the New Republic. In their June 28, 1939, issue, “Who Lied About Spain?”, The New York Times and its reporter, William P. Carney, headed the list. [260kk] Numerous books were also devoted to this topic (see Herbert L. Matthews, A World in Revolution, and Guy Talese, History of the Times). [260ll] Few Americans today are aware of this page of American history, or of this corruption of the principle of freedom of the press by the Catholic hierarchy, or of its implications for population growth control. Ernest Hemingway with film cameraman, Joris Ivens, and two soldiers during the Spanish Civil War. In 1940, Hemingway published For Whom the Bell Tolls, the story of a noble American attached to a Spanish Republican unit. The novel is widely regarded as one of Hemingway’s greatest works. We have witnessed in America since the mid-1970s the application of this same technique for control of the press on the issue of overpopulation. Although the entire press consistently genuflect to the Catholic hierarchy, they are under continuous attack for being too ‘liberal’ and ‘anti-Catholic’. The charge of ‘liberal press’ is always used to attack the anti-Vatican position on every issue. This technique is used hundreds of times each day to control the American press. The Army and the rulers joined the majority of the Spanish people in repudiating Franco-Fascism with the dictator’s death. This left only the Fourth Estate, and notably the outstanding newspaper in the world, the most powerful and important maker of public opinion, The New York Times, to complete the repudiation by confessing the falsehoods and pro-fascism of the past. Its great opportunity came on August 1, 1977, when it published a two-column obituary of its Spanish War correspondent, Herbert L. Matthews. Instead of confessing that it had falsified history during the war by publishing slanted news and outright 100% pure lies from the Franco side, and harassed and intimidated Matthews, who risked his life and told the truth, this dirty-trick obituary added to the sad record of American journalism’s failure. This failure of The New York Times to correct its false history of the fascist officers’ conspiracy and rebellion—wrongly called the ‘Spanish Civil War’ (there were almost no Spaniards in the Franco armies: there were Germans, Italians, and the Terico and Foreign Legion of Muslims)—was so flagrant that for the second time in Times history, if not in all journalism’s history, one of the senior editors of the Times was forced to criticize the Times. John B. Oakes wrote a ‘Letter to the Editor’ and it was printed! ‘McCaw had ordered the copy readers to substitute the word “Insurgents” when I sent “Italians.’ (p. 26). ‘I saw two of Henday’s Associated Press stories [French border] front-paged, both equally false.’ (p. 35). ‘I especially took strong exceptions to the fact that in the effort to be “impartial” the Times had throughout alternately featured mine, Carney’s and AP Henday’s copy from the Franco side, regardless of news value, accuracy, and honesty.’ (p. 39). 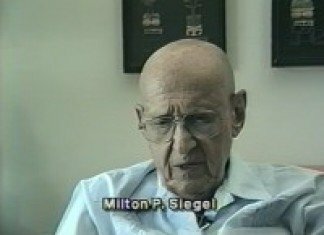 This very same technique is being used in America today by a press manipulated by the Vatican to misinform Americans, minimizing the threat of overpopulation and, in particular, the threat of the greenhouse effect. The Vatican demand is that both sides of the issues be given equal press. An article of falsehoods is published alongside an article of facts. For example, the United Nation’s task force on the greenhouse effect includes 2500 scientists. There are perhaps a half dozen people with credentials who dismiss this theory. The Vatican has successfully insisted that both groups be given equal press or, better yet, none at all. On illegal immigration, the costs to America vastly outweigh the benefits. The Vatican has succeeded in leveling the playing field using this technique of press manipulation. As a result, Americans remain unorganized on the immigration issue. The outcome: press generated confusion prevents effective protests. To this day The New York Times has not published the truth about its falsehoods and pro-fascism of the Spanish war years. We must assume that the Times does not want known the influence of the Catholic hierarchy at the Times during that era. We must also assume that the Times has not acted because the Catholic influence prevails in its editorial offices today. The overthrow of democracy in Spain by the Vatican with the Spanish War of 1936-39 was viewed as a matter of great concern to the Vatican. Their success required substantial control of the press in Spain and in the United States. Halting of population growth control is far more important to the Vatican than Spain ever was and control of the press is critical. The Vatican is succeeding in thwarting population growth control because it is largely controlling the press on this issue. In the case of population growth control (family planning, abortion, immigration) no Catholic reporters, editors or publishers, or their counterparts in the electronic media have distinguished themselves, nor have any non-Catholics. The reason? For anyone to emerge from the pack has been made more difficult by the Vatican than it was even during the Spanish War days. Though it seems that a description of the opposition to population growth control and how the opposition operates would be newsworthy, reporters have not distinguished themselves by making this known. Despite its enormous importance, this information never appears in the press. No doubt the influence of the Knights of Columbus with its membership of 1.5 million means that the American press is not free to report on matters that threaten the security-survival of the Papacy. But as if this were not sufficient, in recent years a new organization has been created to serve as the point of attack on the American freedom of the press—the Catholic League for Religion and Civil Rights. The next chapter is devoted to a survey of the League’s chilling effect on this freedom in the 1990s. [260ii] G. Seldes, “Reformation in Spain, 454 Years Late,” The Churchman (August-September 1978), p. 6. [260jj] G. Seldes, “‘LIBERAL’ — A New Dirty Word,” The Churchman (November 1981), p. 6. [260kk] G. Seldes, “Lies Not Meant For Light,” The Churchman (January 1979), p. 10. [260ll] G. Seldes, “Falsehoods of the Spanish War,” The Churchman (October 1977), p. 7. [260mm] G. Seldes, “‘Christian’ Anti-Communist Crusade,” The Churchman (October 1972), p. 11. [260nn] G. Seldes, “The Roman Church and Franco,” The Churchman (December 1978), p. 10. [260oo] G. Seldes, “Catholic Spain’s Suppressed News,” The Churchman (November 1978), p. 8.